I’ve been on a crappy digicam kick lately. They’re a lot of fun to shoot with — after concerning myself with apertures, depth of fields, gray cards, tripods, flashes, etc. It’s a lot of fun to shoot with a camera that has absolutely no settings except a shutter. The picture above is close to actual size — it’s that small. It takes 640×480 or 320×240 pictures, stores a LOT of pictures (120 hi-res or 300 lo-res) and also works as a webcam or a “movie” camera – it takes a series of pictures in rapid succession. It uses one AAA battery, and can shoot for a day or two on one battery – beware, the memory is volatile – when the battery dies, any pictures not downloaded are lost. 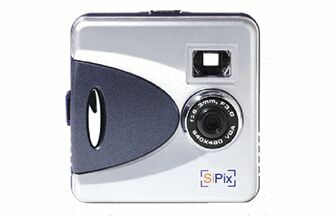 The Stylecam Blink appears with several names, and there’s a StyleCam Blink II and other models from SiPix that resemble the original Blink. Rumor has it that some of the cameras have non-volatile memory and will not lose the pictures when the battery is removed. Let me know if you find this to be the case! With a camera this small, you can carry it with you always. It fits into a shirt pocket, the key pocket of a pair of jeans, and comes with a wrist/neck strap. I’ve already used it to catch pictures I’d normally have missed. The square design is easy to hold, and can be held in your hand for “shooting from the hip”. Minimum System Requirements: Pentium PC with MS Windows 98/98se/ME/2000/XP, 64MB RAM, 90MB available hard disk space, 16-bit color display, CD-ROM drive, USB port. Optional: 28.8kbps modem (for video conference & broadcast), Internet Service Provider (for video conference & email), Sound Blaster or 100% compatible sound card (optional), Speakers and microphone (for voice broadcast).